The day that I was looking forward to with equal parts of anxiety and anticipation has finally dawned. The change that I had mentioned in my post Changes & Priorities is here. Today I sent little D for his first day of pre-school. Actually as I write this, he is still at school, and my mind is running around in circles as to what is going on there. So, since I can’t stop thinking about him, I thought I shall as well write about him. I was looking forward to this milestone from a long time. I had anticipated the kid free time with much excitement, and had made big plans of what I would do in these 3 hours every day. But today I am just a bundle of nerves calling his school every 30 minutes. They assure me that he is doing fine, and actually enjoying his time with his new friends. But really, that is just the equivalent of a drop of cool water in a scorched desert. While I was dropping him off today, I assured him that I will be back to pick him, and that he will be having loads of fun with his friends. I expected him to be slightly upset, and just a little anxious, but instead he was happy and looking forward to playing with his friends. This is what he told me – ‘Go. Do your work, Amma (mom). I will be fine. Don’t worry. I will play. You pick me. Okay?’ That should have reassured me, but instead I had a hard time controlling my tears, which I did, as the last thing I wanted to do was show him how anxious and upset I was. I know sending him to preschool is the best thing for him and for me. He is so ready to make new friends, grow socially and emotionally, and get his first taste of independence. I know I am ready for this time we will spend apart as well. I can take care of my chores while he is in school. As a result of which I will be able to focus on him and have more patience with him when he is home. Because let’s face it, this three-nager phase can be adorable, fulfilling, and heart-warming, but it is also very VERY difficult, and a break is just what is required to maintain our sanity. This day also feels momentous as I know that this is just the first day of the next 18 plus years of his schooling. There is no going back to the precious uninterrupted time I had with my little one. Soon he will progress to kindergarten, and then full day schooling. Eventually there will be college, where he may even have to live away from us. But wait, let’s not go there, college is too far away, and today I am way too emotional to even think about things like that. Did your kid start pre-school this year? Last year? A decade back? I feel like I kind of overacted to the whole situation, especially considering that D did not appear the least bit ruffled. I am curious to hear from you guys. Did you have an experience similar to mine? Did your little one show any signs of separation anxiety at all? Or was overjoyed to just get away like mine? He he this is day one. Wait till he realises this is a daily thing 🙂 It’s really hard letting go. Trust me. I know. But it gets easier. Definitely. Here’s my experience. Gosh it feels like so long ago! Oh I hope he feels this way all the time. This is hard enough without him being upset too. Shanaya Tales recently posted…First Day of Preschool | The First Day of the next 18 plus years. Sniff. Awww Shantala! Sending your child to school/day care for the first time is more difficult for us mums than kids I guess. I remember crying for the entire 3 hrs in the school’s waiting area while my son enjoyed with other kids. But it will get easier on you and you will look forward to these 3 hrs eventually. My best wishes to you and ‘D’. Congrats! You made it through day one? I totally get it. Even though my little one had been going to play school since he turned 18 months, moving him to a proper school a few months ago was hard. But hey, they seem to cope a lot better than we do. They certainly do cope better than us. Actually I am glad about that. This is hard enough even with him being happy about it. I don’t even want to imagine how I would feel if he is all upset about me dropping him off. My kiddo started pre-school this June too. He was always ready before time for school. Cheerful, excited. The teachers loved that about him. Now in the 3rd month with lessons about colors,shapes,… and a lil discipline he is reluctant to go. Everyday we have to control the meltdowns, show him something exciting in or after school. Terrible 2’s they say, lets c.
I on the other hand try to make the most of the 2hours time. Guess it takes time for both parties to settle down & accept it + enjoy it. Congrats. Believe me it does get easier. As in our anxiousness never ends but we learn to deal with it. The change is a big deal for us rather than them. Letting go will get easier in the coming weeks. Shantala, the first day is the toughest. As our whole world revolved around the little one for about 4 years ever since you knew you were pregnant. The sudden change throws us out of rhythm. 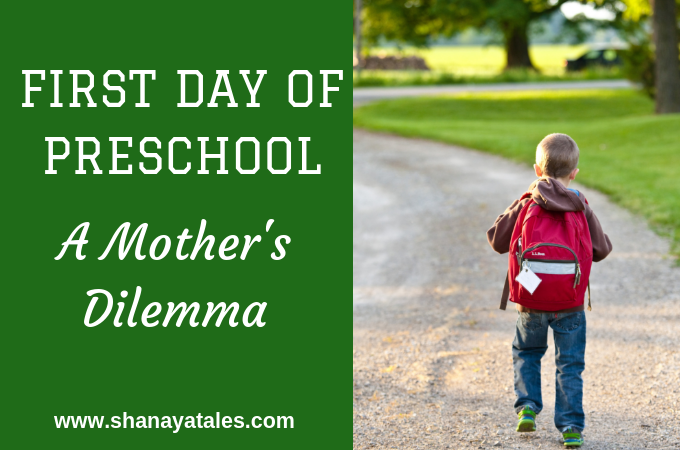 When my elder son went to school the first day, i was distraught. I couldnt spend it at my own home without him as I felt very lonely. But as you said, it is the first of many such first steps, be prepared. . Mine goes to pre-school in a week and I am already a bundle of nerves. Every time we talk about expectations, I am the one who ends up with tears in my eyes. I have already done this once before and it should be easier but it is harder this time around. I think that is because I realize how fast she grew and how little time I have spent with her. I haven’t given her my undivided attention and that makes it all the more harder for this period of separation. No tantrums yet. I hope it stays that way. We have however picked up the American accent within the first few days. He: I made a new friend – Pha-trick. Me: Do you mean Patrick, D? He: No mom, its Pha-trick. Somali K Chakrbarti recently posted…How Entertainment Savvy Are You ? I am not qualified yet to speak on motherhood emotions. I am still the audience and not the protagonist. However, congratulations to you and your kid. The first day and step is successfully done. Awwww Shantala, I can so relate to your anxiety; even though my daughter started hers some 27 years ago. 😀 She wasn’t very happy to let go of Mummy and cried. I promised her that I will wait right outside her playschool. Believe it or not, I don’t enjoy lying and hence, used to wait right outside on the staircase where there was no light nor fan. I used to take a book with me till the day I could tell her truthfully that I will come back to pick her up end of school. It got easier when it was my son’s time to attend school as he had already seen his elder sister going to school everyday. All the best! This is part of a mother growing up 😀 Hugs!!! Lovely post and reflective of the anxiety all parents go through. The love for our kids is gut wrenching, isn’t it? lata recently posted…The day I met Shah Rukh Khan! Awwwww this was so cute. I do not have kids so I’m not too sure about how this feels. Yet. I’m so glad he is so mature and making it so easy for you. Love to him! Congratulations are certainly in order, Shantala! That your little chap is so well-adjusted so soon is a huge credit to you! Hahahaa… I loved the P.P.S part 😀 So much for your gut-wrenching feelings! I am glad that he had a good time. You be happy, okay? Shalini recently posted…Happy Birthday, Blog! You’re Two! This reminds me of an incident , i was going to hostel in class 3 .. my parents went to drop me at the hostel and as my mom says , I said bye to them and went away to play with other children .. Yes, grannies feel bad too…. Congrats to both of you ! Little P went to a Montessori School when she was 2years and six months old , and contrary to her famous-for-their-school-tantrums parents she had a smooth and happy day just like little D.
We are the roots and every new season demands a lot from us but that never prevents us from letting the branches grow further into the sky and see things that we couldn’t. May he have a happy education in school and in life ! this is what I wrote for my DD ,she is about to join her first preschool next week.. We moms are excited as well nervous at same time..
Congrats! This is really a momentous day Shantala! I think it’s a guy thing not to to cry. My daughter cried for a month, but my son didn’t. I used to stand hiding behind the fence when my daughter was taken inside the school, anxious and worried. Those were the days, *sighs*! Enjoy your baby-free hours! As of now, my baby free hours are dominated by his thoughts, but I intend on putting them to good use soon. I agree. Moms are overly protective and can be overly sensitive at times. I am getting used to our new routine now, and he is full of stories when he is back. I like that he is enjoying himself and getting to make new friends, and is exposed to new and different experiences. Congratulations to both of you for making it through the first day and especially your son for being such a sport taking to the school as a fish takes to water 🙂 My son started pre-school last year in India but before that I used to drop him in creches from the age of 2 to attend Parenting courses (those were my saviours) attached to the neighbourhood primary school and children centres. I used to have a terrible time then because my son had huge separation anxiety problems and I have faced tough times dealing with it. Presently he is in kindergarten. He has adjusted well, still every morning when I go to drop him to school bus he does not let me stand and wait until the bus leaves. He wants me to leave as soon as possible else he gets teary on watching me standing. I have realised this is his way of managing his emotions. Congrats and hugs to you, mommy! I don’t have a kid whom I had to send to school, but I have my fur baby, whom I had to send to a doggie boarding (resort for dogs) long ago, when we had to go to Shirdi. That was the first time he was away, from me. I called all the way from Shirdi at least five times to check if he was eating well and staying calm. On our way back, we decided to pick him up from the kennel. And, just like what your little guy did, Chikoo, who saw me standing there with outstretched arms, calling out to him, simply turned around and ran away! I was stunned! Hubby had to literally pick him up and dump him into the car! Can you imagine that? 🙂 That is how our kids are, Shantala. And we idiots cry buckets worrying about them! We know it, and we will still cry buckets, isn’t it? Shilpa Gupte recently posted…Bringing home a pet. LOL!! 99% of the time, it is the parents who are the ones who need comforting and not the kids! In fact, it’s secretly disappointing that they didn’t miss us at all..not even one bit and being kids, they don’t have any hesitation in saying that! Well, I’m definitely glad that he has such a nice group of friends and teachers and now you have some wonderful me-time, confident in the fact that he’s thriving! Roshni recently posted…The end of summer and back to school! That is true, Roshni. I don’t even know how I would have felt about this if he would have been cranky and clingy. I might just have waited another year. Sigh. This mommy thing is HARD! aha! Your blog took me back two decades when I was as jittery as you for those three hours while my little one was in school. They enjoy that freedom and now you can start working on your manuscript ? So been there, done that, but still going there, doing that. You know what I mean! Of course, congratulations on your little Champ! He’s going to shine and you’re going to be so proud of him! But more than her it was MEEEE! trying to suppress my emotional squirms.Surprisingly,It took her just 4 days to outgrow this separation anxiety but for me,the 3 hours felt like 30 hours:(. It really took me a while to get adjusted.She loved her preschool so much.Her buddy time tales were just unending. But it is a really gratifying experience to see your child climbing the ladders with those small steps:)…Isn’t it? Congrats to you! Tinipy recently posted…Excuse me Mom! !But Daddai loves me more! You brought back SUCH memories. When the twins started pre-school I was actually tempted to not send them at all. Seriously, it was so heartbreaking I just wouldn’t have done it had it been an option at all! The good news is that kids get used to all of it way before you do. Be prepared for a tough week and then all will be well (My daughter though, cried for years together!). I remember feeling another huge tug when they graduated to regular school. But they did good. Hugs to you Shantala. Hey Shantala – The post isn’t sappy, but reflects the emotions of a parent. I can totally relate to it. I had all the same feeling when Ishaan, my lil one, started walking. After all, the lil one has to develop as an independent individual being. Thank you so much, Ajay. 🙂 It is very bitter-sweet watching them take the first steps towards independence, isn’t it? I remember when my first son went off to his first day of school. He was so excited and never looked back. It’s such a good sign that your son is confident enough to go out into the world. Susan Gourley recently posted…IWSG: Special Announcement! 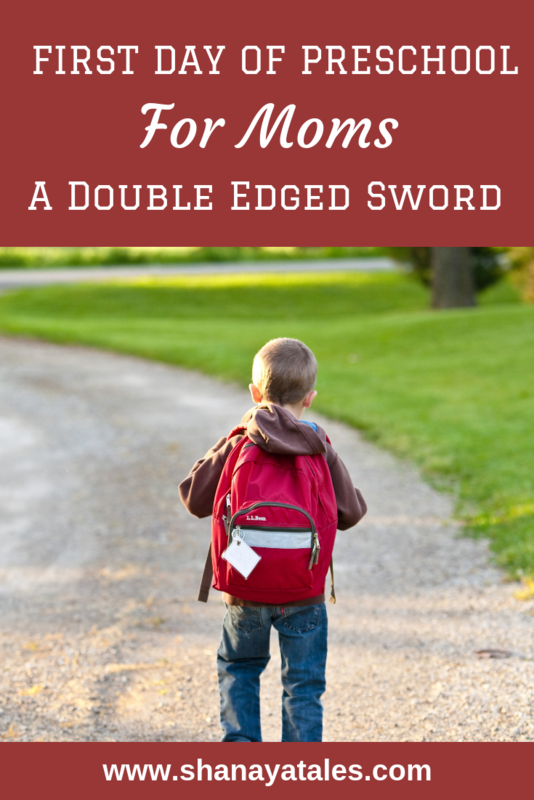 Oh, that post took me many years back back, to when I first sent my kids off to school for the first time. You describe it so well. I can sooo relate to your emotionons…. If its any consolation: it gets easier. I still remember when I in the beginning managed to get away early from work so I could rush off and pick my son up early from school! I was so eager for quality time and then one day when I got there my son was right in the middle of something with his buddies, he looked up at me and said (with some dissapointment) ” muuum, why do I always have to leave so earlyyyy” …. I have started to dry my eyes and it’s almost Oct. so I see there is a light at the end of the tunnel for me as I sent my only child off to preschool at the beginning of Sept. I find myself hugging her a little too long every morning but it’s getting better! I find myself still cleaning up after her and sitting down and reading her little books, Inspector Dewey has been our favorite lately, Kristen Heimerl is the author, is it wrong to want to hug her for giving us a fun book to share? Yep, I’m a sap!! But loved this post as I can’t see how I can do this for 18 more years!! You are very welcome, and yes, you are definitely not alone. Hugs dearie. It will all work out. Worry not.